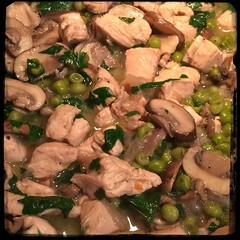 We’re always looking for quick, easy, delicious and nourishing meals, our recipe for Chicken with Cremini Mushrooms and Peas may just fit the bill. This versatile dish can be served with rice, egg noodles or another broad pasta such as pappardelle or tagliatelle. 2. remove from marinade and let sit (and drain) for about 20 minutes, do not throw away marinade. 1. Preheat 2-3 tbsp of olive oil and 1 tbsp of butter in a large deep skillet.Sauté onions, garlic and hot pepper flakes (optional) until onions begin to show some transparency. 3. Add the mushrooms and 2 tbsp of butter.